Got great content but not-so-great audience numbers? You can count on our leading industry platforms to effectively generate awareness and leads. ASI Creative Labs Content Boost packages allow you to distribute your custom content to our existing network of distributors, decorators, embroiderers and end-buyers to drive more qualified leads. Using multiple online and email channels, we’ll connect your content to a relevant audience. 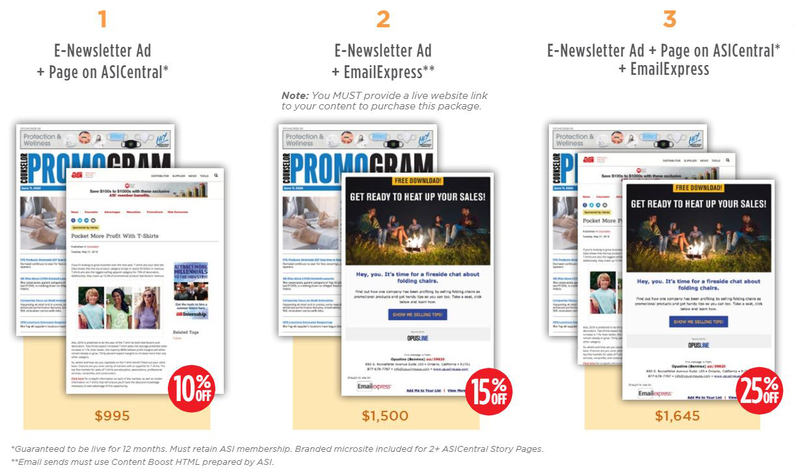 We’ve created 4 comprehensive packages that include content distribution across 3 of our most popular channels: EmailExpress™, our e-newsletters and ASICentral. Take advantage of our ultimate distribution package and we’ll also promote your content to our highly engaged Facebook audience. A multi-media integrated campaign can be created incorporating digital, e-distribution and social media. Full post campaign reporting and analysis can also be provided.